Welcome, the Dodge Enthusiast Connection is a online world-wide, community dedicated to the preservation, restoration, and enjoyment of Chrysler brand vehicles. The connection was built to promote member sites of the Mopar Enthusiast Ring specializing in Dodge brand vehicles and topics. Types of site include Dodge Charger, Dodge Challenger, Dodge Dart, Dodge Demon, Dodge Neon, Dodge Magnum, Dodge Super Bee, Dodge Viper sites and more. Cruising the connection is a great way to locate Dodge related information, web sites and owners on the internet. We are a proud group of automobile enthusiasts with a common interest of preserving and enjoying our classic and modern Dodge vehicles. 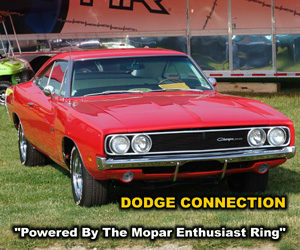 The Dodge Connection Member list is 100% comprised from member sites and pages of the Mopar Enthusiast Ring. Hand picked by the Ringleader, only member sites with pages or resources devoted to Dodge brand topics are considered. The Connection also features a great link section to other non member Dodge resources. Have a Dodge brand vehicle web site or page and want to get listed? The Connection is a great resource for promoting your site or page To be considered for the list you have to be a member of the Mopar Enthusiast Ring in good standing. Joining is totally free and is a great way to get more people to visit your Dodge site or page. For more information on joining visit here. The official history of the Dodge automobile begins in 1914, but the story of the Dodge brothers in the automobile business reaches back even further. John and Horace Dodge were among the pioneers of the Detroit auto industry. The Dodge Brothers Dodge introduced their first vehicle in November, 1914. They produced 249 Dodge cars before the end of the year.The following year, the company produced 45,000 vehicles, putting Dodge into third place in the company’s first complete year as a automobile manufacturer.